I really like the atmosphere of this render. 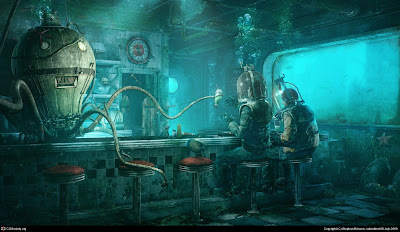 It reminds me of the game Bioshock, mixed with Spongebob Squarepants (Sure, two different things) The image has a really dirty-underwater feel to things, and I like the way the creator uses the view distance to make the surrounding water murky outside of the building. This was created by a guy named Stephan Brisson, along with two others who work for a Digital Enviroment Studio called Meduza Arts (http://meduzarts.com/) The studio have worked on a lot of different projects including Sin City, Sky Captain and the World of Tommorow and last, and certainly least that Chihuahua movie. The website has more work by the company, which is also worth looking at.